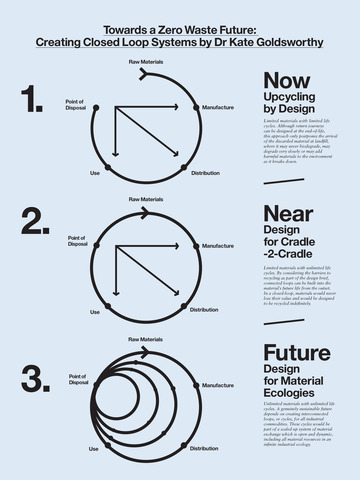 The main aim of this project was to find new tools and finishing techniques for designing recyclable, aesthetic ‘surfaces’ within the context of a ‘closed cycle polyester economy’ (Livingston, 2003). This can be explained as a mechanism of industrial ecology where all waste can be reused in a perpetual material metabolism or system. Of the total textile fibre produced globally, up to 65% is lost, post-consumer, to landfill, incineration or composting. Of this, at least 50% is said to be recyclable (Laursen et al, 2005). In particular polyester, a synthetic fibre group derived from oil, is responsible for as much as 79% of the global synthetic fibre market, at 31.9 million tonnes in 2009 (Engelhardt, 2010), and therefore represents a significant proportion of this textile waste. Polyester is a thermoplastic material and as such is fully recyclable, thus making a closed cycle polyester economy a theoretical possibility. Therefore sending it to landfill is an unnecessary waste of a non-renewable resource. However, if this textile fibre is used without an understanding of its material make-up, this inherent recyclability can be inhibited. Many design approaches to recycling are end-of-life interventions that can be described as ‘extended life techniques’ rather than ‘design for recycling’. In order to design fully recyclable polyester textile products, potential barriers to recycling needed to be identified and ‘designed out’ at the production stages. Current processing and finishing methods such as chemical coatings or lamination, commonly used in the industry’s ever growing desire for performance and functionality, often create barriers to this continuous cycle, by mixing materials with different reprocessing needs into an irreversible state. These complex hybrid materials leave a legacy of waste and prevent inclusion in future fabrications (Allwood et al, 2006). If polyester textile products are preserved as monomaterials during their production they can be returned for reprocessing into virgin quality material over several cycles through chemical repolymerisation. The research set out to find new, technological alternatives to these traditional finishing techniques which could be employed to preserve monomateriality in polyester materials in order to work within the boundaries of a Cradle to Cradle metabolism (McDonough & Braungart, 2002). Laser processing was selected as the most appropriate tool for development, because of its ability to manipulate thermoplastic materials through heat and its potential for flexible control through digital means. The resulting prototypes showed that several finishes which would normally need chemical coatings or adhesives could be achieved without any added agents. In summary, this research contributes to knowledge firstly by proposing a new model for designing ‘Cradle-to-cradle (C2C) textile products’ that can contribute to a future closed- loop material economy and secondly by presenting a new application of laser-welding technology as a tool for the finishing of 100% polyester textiles which can be repolymerised at end-of-life.